19th-century enclosure of upland commons on western slopes of Clwydian hills with roadside cottage encroachments. On the eastern edge of the medieval parish of Llanfair, in the ancient commote of Dyffryn Clwyd, synonymous with the lordship of Ruthin. West-facing upper slopes of the Clwydian hills, between a height of about 190-350m. Little or no evidence of settlement. Sheepfold on lower ground. System of relatively large irregular fields of improved grassland, cleared of bracken and gorse with some recent pasture improvement on western slopes of Moel Llanfair, most of the boundaries being shown on the enclosure award of 1853. Field boundaries probably all originally defined by low banks with quickthorn hedges which have in places have been poorly maintained and grown out or represented by spaced shrubs and augmented or replaced by post and wire fences. Some fields amalgamated and some quite new post and wire field boundaries. Small, scattered woodland plantations. The northern part of the area falls within eastern area of the medieval Bathafarn Park, probably established by at least the creation of the lordship of Ruthin and held by the de Greys in the later 13th century and sold to the Thelwalls before 1592, part of the original park boundary known as Clawdd y Park is still visible as an earthwork across the northern part of this character area, running uphill between Bacheirig farm and the western slopes of Moel Llanfair, and here said to distinguish the park from the upland commons. 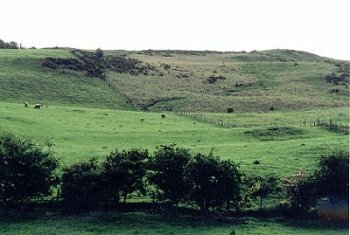 The lower part of the park is known to have undergone considerable improvement during the second half of the 16th century (see the Bathafarn character area), but it seems probable that this upper area remained unenclosed until perhaps the 18th or 19th centuries, with the enlargement of the adjacent lowland farms. Occasional small trackside quarries, probably for house, wall and track building. Large modern farm tracks with eroding scars giving access to hill land north of Bryn Ucha.